October 24, 2017 — The fiery horseshoe prints of the Galloping Hessian stray beyond the borders of the quiescent little hamlet of Sleepy Hollow, it seems. Sleepy Hollow, New York, is a village in the Hudson Valley about 20 minutes from Manhattan. And it’s Headless Horseman Headquarters. Most of the sites in Washington Irving's The Legend of Sleepy Hollow are located there. Irving himself lived and is buried there. And these days the image of the Headless Horseman can be found everywhere in the NYC suburb, from the street signs to the restaurants to the school system. However, inspiration for Irving’s idea came from various sources. Like the name of his gawky protagonist, Ichabod Crane, which was plucked against type from a military colonel who currently molders on Staten Island. 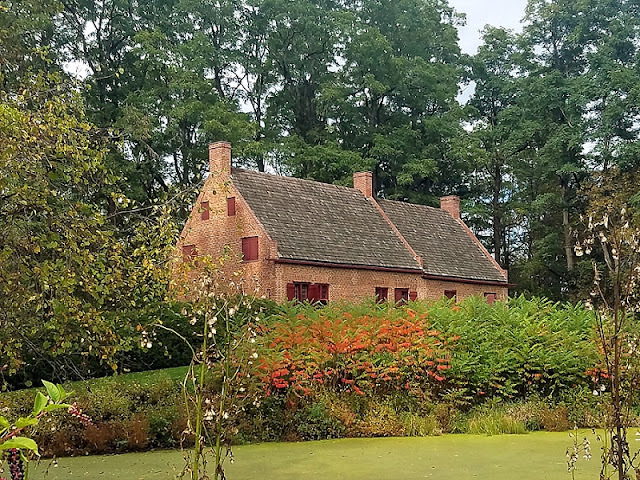 This past weekend, I found myself in another place that claims inspiration for The Legend of Sleepy Hollow, so much so that some believe it was meant to be the original model: Kinderhook, New York. Kinderhook is two hours north of Sleepy Hollow, but is still set cozily in that same valley that is so important to the story. 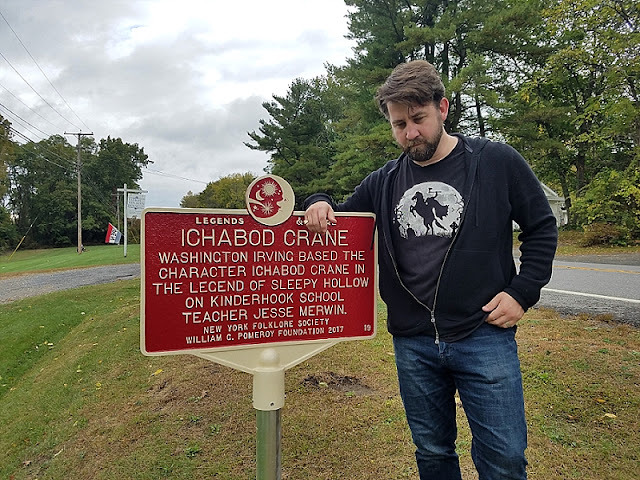 They’ve even gone so far as to name their school district after Ichabod Crane. Their mascot? The Rider. 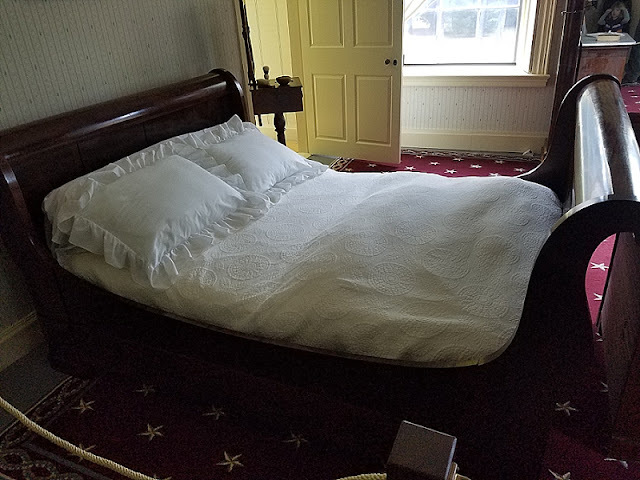 It all starts at the home of a U.S. president—Martin Van Buren, the eighth president of the United States, the first holder of the office born in said country, and the only president whose first language wasn’t English. Van Buren was born in the Dutch community of Kinderhook, and then retired there after his single term as president. 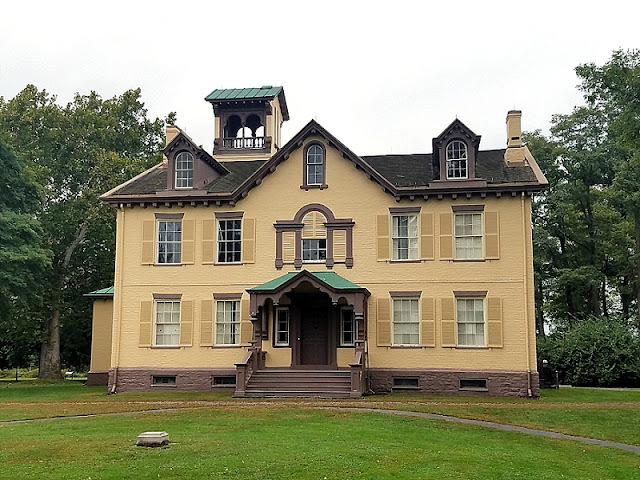 Washington Irving visited the ex-president at his cheery yellow mansion, writing there and, some say, gathering inspiration directly from its citizenry for his The Legend of Sleepy Hollow, which he would later write in London. 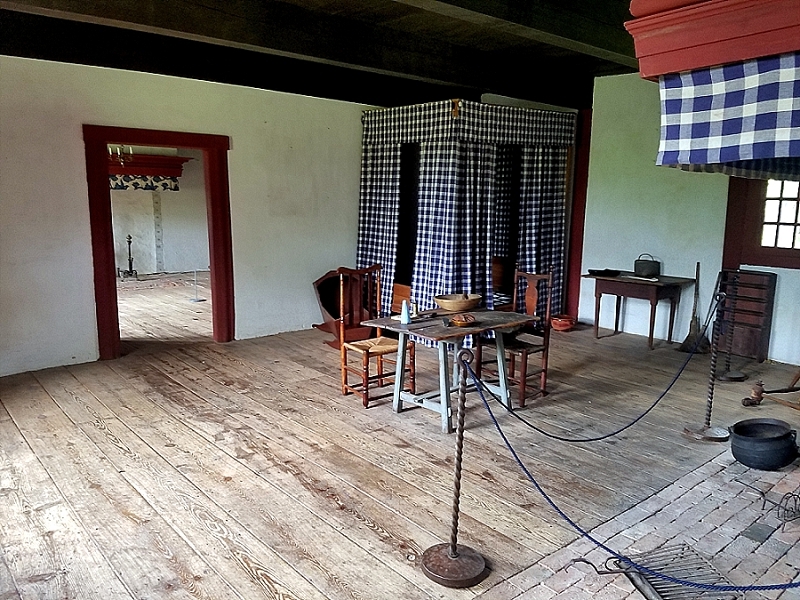 Today, Van Buren’s estate is a historical park, and as we walked its grounds and dropped by its gift shop, I didn’t see a single sign of Irving anywhere, nor any headless riders on dark steeds. The guide took us through the magnificent little mansion, from the house’s tower to Van Buren’s actual deathbed, but he didn’t mention the famous author’s presence. I guess I could have asked him. But instead I asked him for directions to Van Buren’s grave. 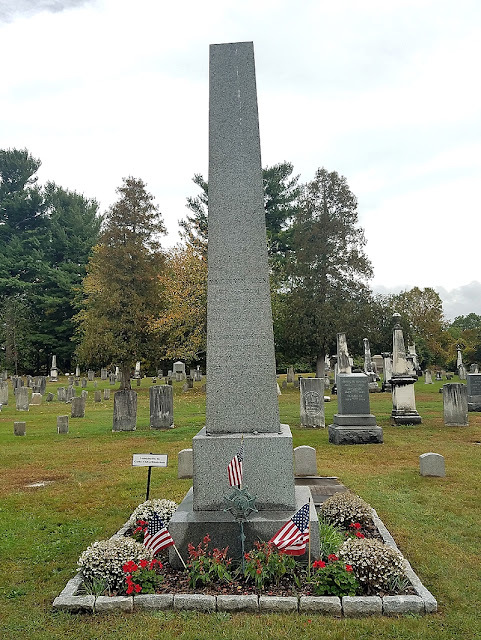 That’s located just a few miles away, at the Kinderhook Reformed Church Cemetery. 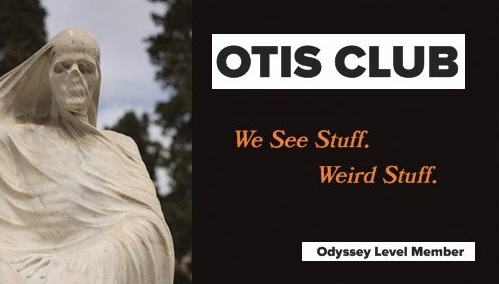 It’s a plain obelisk in a small cemetery, and we didn’t stay long. I just wanted to add another dead president to my list. 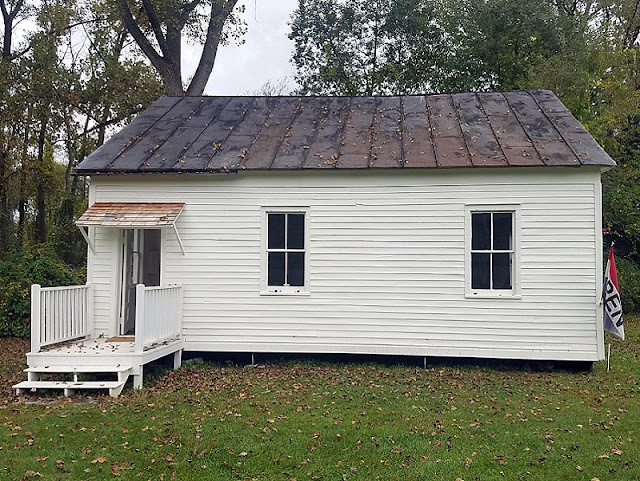 I regret that speed now, though because I would later learn (like right now, in fact, as I prepped for writing this paragraph) that I missed the final resting place of Jesse Merwin, just a few stones away from Van Buren. It’s long been held that Merwin was the model for Ichabod Crane. But I at least knew about Jessie Merwin at the time. After all, I was headed to his schoolhouse next. Sorta. Jesse Merwin was a schoolteacher, and a friend of Washington Irving’s. The one-room schoolhouse where he taught isn’t around anymore, but Kinderhook does have a nineteenth century one-room building that served for a time in the 20th century as a schoolhouse. 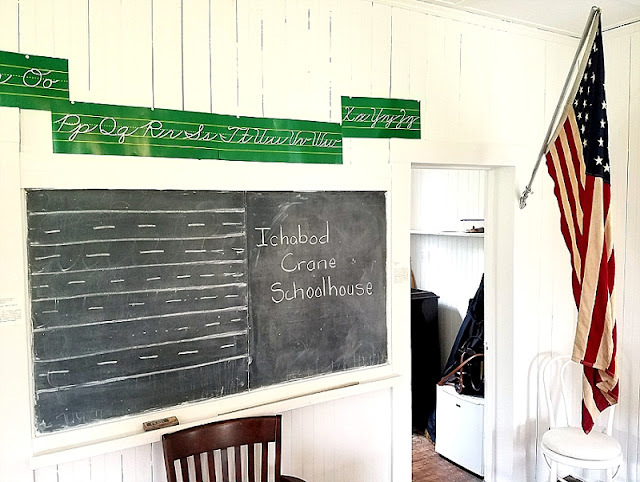 These days, they call it the Ichabod Crane Schoolhouse. The name’s chalked in neat teacher print right on the blackboard, in fact. 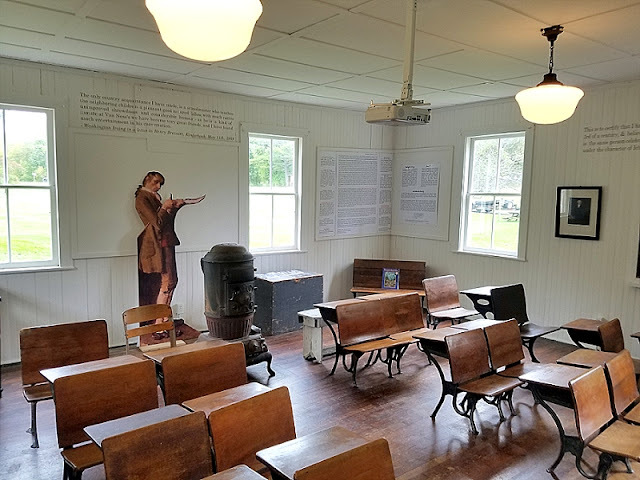 Inside are a couple of exhibits, but mostly it’s set up like the rustic, one-room schoolhouse it was. From there, we were led around a pond to tour the Luykas Van Alyn House (or Van Alen, as it’s sometimes written), a 1737 Dutch farmhouse that some believe was the model for the Van Tassel residence, with the Van Alyn daughter in particular being the model for Katrina Van Tassel. And if you don’t believe me there are two historical signs on the side of the road that you can argue with. The house is open and rustic and pretty much empty, but it gives a good sense of life back in the day, although it seemed smaller than how I envisioned the Van Tassel place in the story, where the harvest party was set and where Crane hears the legend before setting off to be chased by it. Eventually we left ourselves, although nothing spookier than a few black bat houses on the surrounding trees was there to meet us. Anyway, all of that makes some wonder if Kinderhook was meant to be Irving’s original placement for his story. That maybe he moved the location so as not to offend those whom he might have been caricaturing. Between you and me, The Legend of Kinderhook sounds like a much more menacing title.